Lucy feels she hasn't been spending enough quality time with teenaged daugher Chris. The ladies are both hot for the handsome clerk at the sporting goods store where Lucy came to buy roller skates. Lucy lies to the bachelor about her shoe size and gets a pair that's far too tight. Despite the fact Lucy hasn't been roller skating in years, she joins Chris in an afternoon of skating fun. When she returns home, she discovers her feet are so swollen she can't remove her skates making it impossible if she's going to the big dance that night. Lucy goes anyhow and must wear the skates to the formal dance at the country club that evening. Special Notes: There is a fresh opening for the new season, with clips from both the black-and-white and color episodes strung together. The discrepancy doesn't matter at this point, as the series is still telecast in black and white. 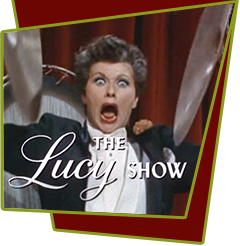 Gale Gordon who appeared in the previous season starting with episode #34, "Lucy Gets Locked in the Vault" is now a regular as a foil for Lucy since Vivian Vance is appearing less and less.